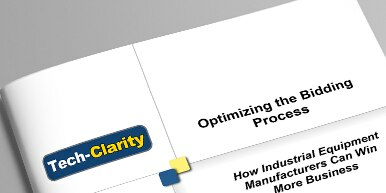 Industrial equipment manufacturers can boost profitability without increasing resources. Tech-Clarity shows that this can be achieved with faster and more accurate bids. Industrial equipment manufacturers know that an effective bidding process is critical to the success of the business. But it can be very difficult to ensure that bids are both fast, to create a competitive advantage, and accurate, to maintain profitability. An optimized bid process helps companies with more competitive bids and as a result, they win more business. Read the report to find out more.